If you are looking for us to reveal the retirement plans secrets and magical ways to build your retirement cash flow, we will have to disappoint you because there are really no “secrets” and no magic when it comes to retirement plans. There are only 3 major components of successful retirement plan, namely, sound financial planning, living within your means and starting planning for retirement early. Ideally, as soon as you land your first job, you automatically have to start devising your retirement plans. All retirement plans should start with the vision of your financial future, the desired lifestyle you want to have at your retirement age and your ultimate goals. If making retirement plans is making your head spin from all the available options, we can help break it down for you. Ideally, you should start your retirement planning by plugging in data in a free online retirement savings calculator. It should give you an idea of how much retirement cash flow you can expect based on your income, current investments and savings. First of all, one of the obvious retirement saving tools that comes to mind almost immediately is your 401K benefits offered through your employer. Find out all the details, rules and regulations of the best 401K plans that your employer offers that you can take advantage of. There are a variety of 401K plans and they offer multiple features but they have one thing in common, tax advantages. 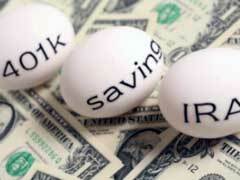 401K retirement plans allow you to take advantage of deferring your income taxes until you retire. This creates a great opportunity for your retirement investment to grow over the years exponentially. But that’s not it, many companies not only offer great 401K’s, they are even willing to match your contributions into their plans. This free money can increase in value over the years creating a nice retirement cushion to live off. The best 401K investment advice is to max out your contributions to the maximum amount of your employer’s annual matching limit. 401K employer sponsored plans serve multiple purposes for individuals planning for retirement, namely, automatic savings, employer match benefits and, since there are penalties for early withdrawals, people are less likely to spend the money before reaching their actual retirement age. Self directed 401K could also be an option if your employer offers it and is good for individuals with profound knowledge of IRA rules and alternative investment mechanisms allowing them to allocate retirement investments in other market sectors, like real estate, for example. Before you decide to go the self directed route, make sure you know what you are doing because you can be fined and held for back taxes if you break the IRS rules. However, if you are working for a smaller family owned company, your employer might not be offering a traditional 401K. Smaller companies usually offer their employees a much simpler plan and more cost effective that helps them save for retirement, namely, a SIMPLE (savings incentive match plan for employees). As of 2011, SIMPLE IRA contribution limits were established at $11,5K for employees younger than 50 years of age and $14K for individuals who are older. Alternatively, your employer can offer you a SEP IRA account that stands for simplified employee pension plan. SEP IRA’s are perhaps the least costly for your employer and does not require complicated bookkeeping system that is necessary for companies offering traditional 401K plans. Make certain to find out what rules your employer has in place for cashing out 401K plans. To further diversify your retirement plans and add a variety of investment mechanisms of your choice, you can additionally consider opening an IRA account. A lot of people are not sure about IRA vs 401K difference and what it means for their retirement plans. If you can afford it, open both traditional IRA and 401K plan through your employer to maximize your retirement returns in the future. Traditional IRA allows individuals to save for retirement on a similar tax deferred basis but there’s a catch, contribution limits are established at a maximum of $5K for people under 50 years of age and $6K for individuals over the age threshold. Traditional IRA contributions might not qualify for tax deductions if you earn over a certain amount but one thing is for sure, your IRA growth funds are tax deferred. There are multiple IRA withdrawal rules and you must learn as much as you can about them before making a distribution to avoid incurring a penalty and to undo all the hard work you have done saving for your retirement. Roth IRA is another incredible driving force for making retirement plans. Roth IRA’s contributions are not tax deductible but all the interest you accumulate over the years is not subject to tax, so Roth IRA is a way to grow your after tax money, in layman’s terms so to speak. There are also benefits that you will not find in a traditional IRA, there are no withdrawal penalties and you are free to withdraw a portion of your principal in case you experience the need for extra money. In addition, you are not forced to start withdrawing money as in traditional IRA. So there are a lot of obvious benefits to also start investing into your Roth IRA.